The future of the Buffalo Sabres has started to arrive. On Sunday, it was defenseman Will Borgen. The St. Cloud State defenseman signed a three-year entry-level contract with the team. He was Buffalo’s fourth-round draft pick in 2015. Then on Monday, reports indicated that Casey Mittelstadt had agreed to a deal with the Sabres. The University of Minnesota forward was Buffalo’s first-round pick in 2017 (No. 8 overall), and he is considered one of the top young players in the world. As a bonus to those in the KeyBank Center who have suffered through a dreary season, Middelstadt’s skills will be on display to Sabres fans soon. He will join the team immediately, and might play at the KeyBank Center as soon as Thursday night against the Detroit Red Wings. The Sabres had to pay a price to lure Mittelstadt into their ranks. He signed a three-year entry level contract, effective immediately. That means one of the years in that deal will be spent this season. Mittelstadt, therefore, will be eligible to negotiate a new contract in the summer of 2020. This means the talented young forward will have the chance to earn substantially more money in 2020-21 than the $925,000 he would have earned under an entry-level deal. The Sabres apparently had to pay that price in order to get him to sign now. Mittelstadt can not play in Rochester this season. In contrast, Borgen also signed a three-year deal, but it will start in the fall. He will play in Rochester under an amateur tryout contract, and then the deal with the Sabres kicks in at the start of next season. The Sabres also had announced on Sunday that forward Judd Peterson of St. Cloud State had agreed to an amateur tryout contract with Rochester. He was a seventh-round pick of Buffalo in 2012. The Sabres hope that Mittelstadt is a huge piece of their rebuilding program. 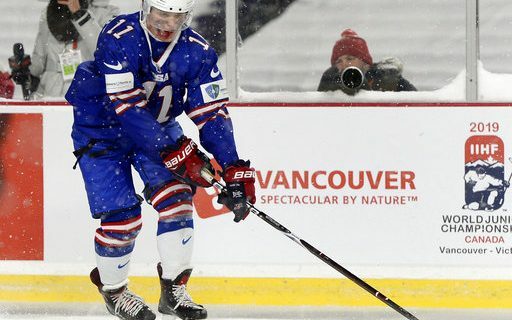 He was the Most Valuable Player of the World Junior Hockey Championships this past season, as he led the United States team to a bronze medal. Mittelstadt had 30 points in 34 games for Minnesota, second on the team. Borgen’s stock has gone up while playing three years at St. Cloud State. He was the Defensive Defenseman of the year in the National Collegiate Hockey Conference (NCHC). Borgen was a member of the U.S. Olympic team in South Korea, but did not see action. While defensemen often need time to develop and often spend at least a full season in the minors, Borgen may have the opportunity to advance quicker than most. The Sabres’ defensive group is liable to be in flux this summer after the difficult season. It’s that odd time of the year in pro hockey when reinforcements for the remainder of the season can arrive from the college game. The NCAA season is winding down, and all but the best squads have finished their seasons. That means that players are free to turn professional and sign with NHL teams that drafted them with a variety of restrictions.